Snap by Lectora is a new rapid eLearning development tool created by Trivantis (creators of Lectora). With Snap you can write and design an eLearning course within PowerPoint then use Snap to convert it into a Flash based course, ready for deployment on the web, LMS or CD-Rom. Snap actually works as an add-on to PowerPoint and offers very similar functionality to Articulate Studio Pro, but at a fraction of the price. Snap currently costs $99 while Articulate Studio Pro costs $1398. While Articulate has extra functionality that some users couldn’t do without (particularly around interface customisation), Snap will be adequate for a lot of people. Anyone comfortable using PowerPoint should be able to create courses with Snap. Because of its ease-of-use and lack of customisation options, I’d say that Snap is aimed more at Instructional Designers or in-house training staff rather than content developers. Creating a course in Snap is very easy. Simply create slides in PowerPoint as you normally would and add text and images where required. Once installed Snap appears as a new ribbon within PowerPoint. Like Articulate, when you publish a Snap course from PowerPoint, the project is converted to Flash. PowerPoint animations are included as well as some slide transitions. Unfortunately you don’t know which transitions are supported until you publish the course. Snap comes with a built-in Quiz and Survey builder. All the usual question types can be found here: True / False, Multi-Choice, Multi-Response, Fill In, Matching, Drag and Drop, Hotspot, Essay and Likert. Unlike Articulate, you cannot rearrange the layout of Quiz and Survey objects within the quiz / survey builders. Snap doesn’t have any built-in interactions (known as Engage interactions to Articulate users) so if you want interactive elements within your course, you’ll have to create them in PowerPoint or Flash. Snap lets you record both video and audio narration for your slides, as well as letting you import pre-recorded narration. Snap doesn’t have it’s own video import feature. There is an option to link YouTube videos, but there are problems with this approach. Many large corporates block YouTube access which would prevent YouTube videos from playing back. Also, what happens if you aren’t the owner of the video and it is removed on renamed? You can insert video using PowerPoint’s interface but when Snap publishes it, the compression is pretty horrendous - even with a high quality setting. Another drawback with this approach is that when you publish your course you can end up with quite a large file because the video is included within the published Flash .swf along with the course content. More on this at the end of the Publish Formats section below. Audio can be inserted into PowerPoint in the normal way and is published with the rest of your project. There is also an option to add a background music track to your course - I’m pretty sure this will be the least used feature in the whole application! Flash files (.swf) can be imported with ease and re-sized accordingly. Web Window: Used to display a website or HTML content within a slide. When publishing a course in Snap you have a choice of five different player templates (or skins) to choose from. 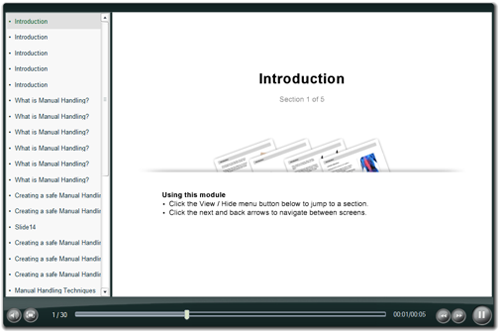 Unfortunately these all have the same standard eLearning layout but with slightly different styling: left hand menu, content to the right and a toolbar at the bottom. You can tweak the colours and add a logo but other than that, you have no control over the appearance of the interface. For me, this is one of Snaps biggest limitations and restricts it to only being of use on projects where clients are happy to use one of the built-in templates. When publishing a Snap project, all PowerPoint slides along with any quizzes or surveys you’ve created are converted into Flash. Having used Articulate for 6 months now, one bug bear I have is the length of time it takes to publish - particularly larger courses. A 100 slide course (split into sections) can take 20 minutes to publish. After some tests, I found that Snap often published courses in around half the time Articulate took. Web: An HTML file with a Flash file embedded into it - can be deployed anywhere. Snap Live: A free hosting service offered by Trivantis. (content can be uploaded free and stay there for 30 days). CD-Rom: For standalone, offline courses. CourseMill: A paid for LMS service by Trivantis. LMS: For deployment on a SCORM or AICC compliant LMS. One slightly worrying thing I noticed when publishing courses from Snap is that the entire course (i.e. all the PowerPoint slides and content) is published into a single Flash .swf file. This contrasts with the Articulate approach where each slide is turned into a single .swf and loaded into the main player. For larger projects (especially with embedded video and audio) you could end up with a rather large file, causing problems for users on slower / limited connections - often the case for large corporations with limited bandwidth. The export tab within Snap has a very interesting feature - it allows you to export Snap courses to Lectora or Lectora online. This means you can write a course in Snap then open and edit it in Lectora. The export to Lectora option throws up some interesting ideas for possible changes to the workflow of a project where Lectora is used as the main content development tool. SME supplies course information (usually Word format with far too much text). Instructional Designers turn this information into an eLearning script (Word format - still chance of too much text in places). eLearning developer builds course by creating structure and copying text from script into Lectora (plus adding graphics, media, quizzes, Flash interactions, videos, etc). Draft of course is published and passed onto client for review. In the above scenario, Word is used during the course writing process so it can be hard to grasp how the project will look / read on screen. SME supplies course information (in Word, or even better in PowerPoint template supplied to them). Instructional Designers work on script within a PowerPoint template that has been setup to easily import into Lectora. eLearning developer exports PowerPoint from Snap to Lectora where the structure is automatically created and all the text is in place and editable (graphics, media, quizzes, Flash interactions, videos etc. are then added). Benefits of this approach would be Instructional Designers (or even SMEs if the client was willing) would have an idea of how the course would look on screen before any development had been done. Developers wouldn’t have to copy all the text from a Word script into Lectora. This approach would require quite a bit of experimenting to see if it was a viable alternative. Look out for a follow up post that discusses the pros and cons of this approach. For $99, Snap lives up to its name. This is just the first version and I’m sure newer versions will have an improved feature set. As it is, there are probably enough features for many users who will want to use it for low budget, rapid turnaround projects. Until there is better video support and more options to customise the player templates, I’d only recommend it as the main authoring tool for projects where you don’t use video and you are happy to use one of the built-in player templates.